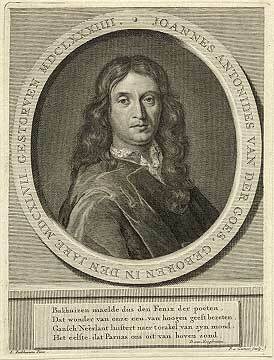 Joannes Antonides by L. Bakhuizen, 17th century. Joannes Antonides (usually called Antonides van der Goes, after Goes, Holland, the place of his birth) was born 3 May 1647 and died 15 September 1684 in Rotterdam. By his contemporaries he was regarded as one of the greatest poets, but that opinion is no longer held. His parents were simple members of the Mennonite congregation at Goes; his father, Anthoni Janssen, also tried to write verse. When Joannes was four years old, his parents moved to Amsterdam, where Joannes attended the Latin school and then worked in an apothecary shop. Later he studied medicine at the university of Utrecht and received his doctor's degree on 5 June 1674, after which he became a physician in Rotterdam. Antonides took no active part in the congregational life. It is not even certain that he joined that church, although Samuel Müller regards him as having been a member. Zijpp, Nanne van der. "Antonides, Joannes (1647-1684)." Global Anabaptist Mennonite Encyclopedia Online. 1953. Web. 24 Apr 2019. http://gameo.org/index.php?title=Antonides,_Joannes_(1647-1684)&oldid=131394. Zijpp, Nanne van der. (1953). Antonides, Joannes (1647-1684). Global Anabaptist Mennonite Encyclopedia Online. Retrieved 24 April 2019, from http://gameo.org/index.php?title=Antonides,_Joannes_(1647-1684)&oldid=131394. Adapted by permission of Herald Press, Harrisonburg, Virginia, from Mennonite Encyclopedia, Vol. 1, p. 133. All rights reserved. This page was last modified on 13 April 2015, at 00:36.